While on the subject of the play Cymbeline, I’d like to share an essay by Oxfordian researcher Mildred Sexton. Although the paper was completed by 1997, her insights and themes are every bit as important and striking today. Injustice to faithful subjects is the driving force behind the author’s efforts to council Queen Elizabeth regarding the strengths and weaknesses of her monarchy. He used the medium of drama, with its allegory, metaphor and imagery to paint powerful pictures for the Queen and members of her court about matters important to her monarchy and to their own lives as well. It was his hope to make an impact upon specific events and consequently upon State policy. This was a common practice of playwrights of the time, and in order to understand the plays, we must seat ourselves among the members of the Court audience and try to know and understand what they knew and how they felt. In the Renaissance, it was the practice to reach back into the past for important works of antiquity and to apply Christian moral principles to them for use in contemporary life. This is exactly what the author did with Cymbeline. He reached back into early British history to the reign of an ancient king who came to power at the time of the birth of Christ. He intertwined this religious association with mythological as well as biblical references. These references were used as metaphors in his instructions to the Queen and her subjects about the ancient values of true monarchy so desperately needed at the current time. He also used great elements of symbolism about the current condition of Church/State policy which carried so powerful a message to the Queen and the Court that the play was revived during King James’ reign when a situation of similar import was occurring. The solution of the authorship question revealing Edward de Vere, seventeenth earl of Oxford, to be the true author of the Shake-Speare works has provided answers to the many of the questions which have puzzled play goers and scholars alike. The trick, now, is to realize that Oxford’s Court audience would have understood these plays. What do we need to know that they knew? First of all, we need to know that Elizabethans were steeped in knowledge of the Bible, Greek and Roman history, literature, myths and legends. We must learn to recognize subtle references to the works of the Roman poet, Ovid and to Greek mythology. The audience also knew their ancient British history, myths and legends as well as astrology, magic and superstition. They didn’t just think about them occasionally. All of these elements were part of their everyday lives. It is not like that with us. We have to expand our knowledge and make a real adjustment in our thinking if we are going to have a chance at understanding. In order to begin to grasp the full meaning of this play we must perceive its chronological position in the canon and pinpoint the contemporary period on which the author focused. We need to know that Cymbeline was originally a very early play, the original version probably written in the author’s teen-age years. This is indicated by the use of the characters from the old Morality plays, Virtue and Vice, the True Church and the False Church. In Cymbeline, Oxford transformed the latter to represent the true Church of England and Catholicism, the false church of Rome and the Pope. The author’s limited use of imagery also indicates that this is an early play. We clearly see his imagery growing and blossoming in his later works to be the miracle of the ages. The use of soliloquies of minor characters to merely forward or explain the action is another early technique. The internalizing of thoughts and emotions was to come later as he matured in his craft. The crude use of the vision scene and the soothsayer would be handled much more smoothly in Hamlet, for instance, Macbeth or Julius Caesar. It is possible to speculate from the rather idealized relationship between Imogen and Postumus, that the original version of this play was written before the author had experienced such feelings himself. He seems to be taking a view learned from others at this stage of his development as a writer. In his later works, relationships between lovers would seem to come from his own personal experiences. It has become obvious that the play was reworked, with topical references inserted over a long period of time, even after Oxford’s death. For instance, we hear the word “fury” calling to mind the Spanish Fury, the Roman Catholic fanaticism of the massacre at Antwerp in 1576. The defeat of the Spanish Armada in 1588 is reflected in the defeat of the Romans in the play. In the spirit of the Renaissance, the author uses these allegorical references to orient the audience and reflect upon events in Elizabeth’s monarchy. We can see that to be aware of even these few metaphorical associations, we need to acquaint ourselves with the code of allegory and metaphor used by all of the writers of the day which the Court audience understood but has escaped us until now. In listening to this play, we need to know that one of the myths which the British believed – it wasn’t true, but they believed it and held it in emotional regard – was that Britain was founded by the Trojan, Bruté. Bruté’s wife was Imogen. Bruté’s grand sire was Postumus. Since the names are the same, but the relationships are different in the play, it must be understood that this is merely symbolism representing the origins of the British people. Oxford wanted his audience to reflect back upon the strengths of the ancient monarchies and compare them to what was going on at the current time. Like every good playwright, Oxford tells us what the play is going to be about in the first scene. Here we learn that Posthumus has been banished, unjustly, for treason. Oxford’s audience was in the midst of a Church/State controversy beginning with the Counter Reformation dating from 1572. The current crisis involved Elizabeth’s position as both Head of State and Head of the Church. In Cymbeline’s time he was the undisputed head of both Church and State. At this particular time in Elizabeth’s reign, Catholics recognized the Pope as Head of the Church, and therein lies the rub. If a citizen didn’t recognize the Queen as Head of the Church, then it follows that he didn’t acknowledge her as Head of the State, and that was considered treason! 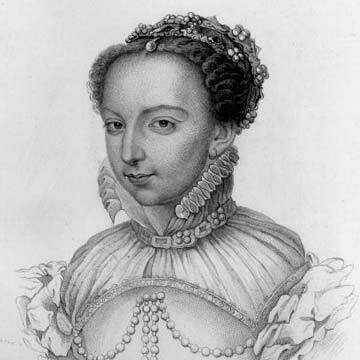 Elizabeth’s monarchy was continually threatened by plots for her overthrow by the Catholic powers of France and Spain supported by English Catholic sympathizers. She felt she had no other choice but to weed out troublemakers. Consequently, Catholics were subjected to questioning worse than the Spanish Inquisition, and the verdict was invariably treason which carried horrendous penalties. Oxford had turned toward Catholicism, it is believed, during his trip to Italy in the mid-1570’s. We recognize him in the character of Posthumus, who after being unjustly banished from court goes to Rome. Oxford’s audience understood that, metaphorically, this meant that Posthumus had gone over the Roman Catholic Church. At the time of a revision of this play in the early 1580’s Oxford had unwittingly become involved in a political plot of the Catholic sympathizers Lord Henry Howard, Philip earl of Arundel and Robert Southwell. These three, without Oxford’s knowledge, plotted with France and Spain to land troops in England, murder Elizabeth and put the Catholic Mary Queen of Scots on the throne. When Oxford found out, he immediately informed the Queen, who went into such a state of terror that she threw him and the other three into the Tower until she could sort it all out. Oxford was finally exonerated, but Elizabeth sent him from her court. He was so terribly hurt by being banished in the face of having saved her life, and in consequence her monarchy, that he poured it all out in Postumus’ and Belarius’ speeches about injustice, introducing this as his main theme. This was such a traumatic event for Oxford that he wrote the sad song about “Friendship remembered not” in As You Like It and portrayed the three real villains as Don John (Henry Howard), Borachio and Conrad (Arundel and Southwell) in Much Ado About Nothing. The character, Hero, suffers the same fate as Oxford of having been plotted against and not believed. Playwriting continually offered a form of expiation for the misunderstood nobleman. It is important to remember that although the events of the play as well as those of Elizabeth’s reign occurred against the background of the religio/political conflict, Oxford focused upon a much deeper level of concern, namely, the right of the individual to have his own thoughts and beliefs. This had been the focus of the argument of those who were accused of treason for their religious beliefs. Their lawyers argued that thoughts were “private property” and as such were protected by law. Oxford believed deeply in the rights of the individual and presented this message time and time again in the plays. In Cymbeline, he felt that an additional message must be made clear to the Queen. This was that, although her subjects might entertain different thoughts and beliefs, she must believe in their unassailable loyalty to the crown, no matter what those beliefs might be. This is the argument in the final scene of the play where all come together to support the monarch. Such a message would not have been lost on Elizabeth during this time of grave doubts about the loyalties of those around her. As was mentioned at the outset, this play contains great layers of symbolism. Modern playgoers must practice the skills of handling symbolism at which Oxford’s audience was so very adept. They found completely comprehensible, situations which we find ridiculous because we are seeing them as involving individual characters rather than ideas. We are especially taxed by this play. However, our enjoyment is increased ten-fold when we are able to make the shift, and see the symbolism begin to emerge from those speeches which seem the most puzzling. As we listen to the play, we are charmed by the Boccaccio tale of the devoted couple caught up in the evils that surround them, which occupies the beginning of the play. Imogen is one of Oxford’s most beloved heroines. However, she is too good to be true, and we soon see her become, through the constant biblical references, a symbol of the ancient True Church beset by the actions of the False Church or, in Oxford’s time, the Church of Rome. Oxford’s audience would have followed her trials with the same sympathy that we feel. However, because of their cultural background, they would have felt the undercurrents of the religious, moral and political messages. So, now we come to understand that the play is operating on two levels at once. Not only is Imogen the faithful wife, but her trials also represent the trials of the True Church of scripture. The symbolic characters representing instruments of the False Church, the Catholic Church viewed as the antichrist, are introduced in quick succession. These characters are identified as instruments of Satan by standard characteristics well known to Oxford’s audience through the old Morality plays. These include poisons, magic, dissembling, lying, deceit, having bodies of filth and foul smells and the use of disguises. The first of these characters exhibiting the requisite attributes is, of course, the queen. Keep in mind that the author is presenting his ideas on several levels at once. On the contemporary political level the evil queen parodies the French Catholic queen Catherine de Medici with HER poisons, HER plot to gain the throne of England by marrying HER son to Elizabeth. And so the association is made with the audience. Next we are introduced to the despicable Cloten, the queen’s son. He is a parody of Catherine’s son, François, Duc d’Alençon, seen by many courtiers as the antichrist with the tell-tale characteristics. The character’s name suggests a clot of clay or dirt. His attendants tell him that his shirt smells so foul. He uses the disguise of Postumus’ clothes to try to trick Imogen and Guiderius. All fit Satan’s profile. And finally Iachimo – little Iago – who lies and dissembles with Postumus and Imogen. We hear him use the word “religion” shortly before he, an instrument of Satan, uses the word “covenant” in making the pact with the unwitting Postumus. Oxford makes a pact with the devil when he gets involved with Howard and Arundel. So now we see that Oxford has asked his audience to contemplate the fate of the true apostolic church of primitive British history as a symbol of the situation in Elizabeth’s monarchy beset by the various manifestations of the antichrist. The false church of Rome in the play points to the French Catholic faction under Catherine and Alençon, and the Spanish Catholic forces are suggested by the Romans of the play, Augustus Caesar/ Philip of Spain, and the ambassador, Lucius/ the Spanish ambassador Mendoza. As the play progresses, Postumus/Oxford, our true and faithful knight, has become disillusioned through the machinations of the character Iachimo. In the meantime Imogen is being revealed more and more as the True Church of the Bible as she succumbs to the misleading contents of Postumus’ letter and begins, like the Church wandering in the wilderness, her journey toward Milford Haven. Here, the setting is a far western part of Wales where the ancient kings reigned and where the ancient Christian Church had arisen. This allies the association of the setting in the minds of the audience with the other symbols in the play. Later in history, Milford Haven would be the landing place for Henry Tudor to make his move to conquer Richard III and establish the Tudor dynasty of which Elizabeth was the reigning heir. It was also here that Philip of Spain had just recently planned to land troops to lay siege to Elizabeth’s throne. Writing about this event in the form of allegory, Oxford has the Romans of the play landing at Milford Haven to launch their attack upon Cymbeline’s forces. Milford Haven is revealed as highly symbolic to Oxford’s audience, so the metaphor was powerful at many levels, the ancient and the contemporary, the political and the religious. So – we see Imogen wandering toward Milford Haven and the longed for reunion with her husband, but she finally almost gives up as Postumus servant, Pisanio, tells her of her husband’s orders for her death. Asking Pisanio to kill her, she uses the term “lamb” from the Bible suggesting the sacrificial lamb. We now begin to recognize the biblical references which come straight out of the Book of Revelation. In this Book of the Bible, the True Church is confronted by the Whore of Babylon and other antichrist monsters just as Imogen is set upon by the machinations of the queen, Cloten and Iachimo. When Pisanio relents, Imogen finds her way to the cave of Belarius and Cymbeline’s sons where she is repeatedly referred to as an “angel”, as the figure of the Church is called in the scriptures. Oxford has again tied the religious to the secular by introducing Imogen, the Church, to the characters of Cymbeline’s sons, Guiderius and Arviragus who represent the succession to the monarchy. Oxford gives these boys additional names from Greek mythology, Polydore and Cadwal. It is important for us to know at the outset what the Court audience knew, and they knew who Polydore and Cadwal were and were well aware of their significance to the symbolism of the play. Cadwal, or Cadwallader, the Welshman, was the last king of the ancient Britons. So, we have Britain’s mythic roots in the Troy legend reaching through the reign of Cymbeline up to Cadwallader in 633. The audience would now see that the author is asking them to consider the whole of the ancient monarchies as a symbol of Elizabeth’s roots and the symbol to which the Elizabethans should be looking for answers during these troubled times. This is the Renaissance practice of applying the lessons of the past to the present. In the Book of Revelation, the champion of the True Church slays the dragon figure of the False Church and throws the body into the lake of fire and brimstone. In the play, the figure of the antichrist, Cloten, challenges Guiderius, heir to the throne, the symbol of the head of both Church and State, trying to trick him by wearing the clothes of the virtuous subject, Postumus. Guiderius is not fooled and immediately strikes off his head throwing it into the creek behind the rock (the Rock of Ages, the Church). He strikes off the head of the antichrist, the False Church, symbolically to Oxford’s audience, the Catholic faith. This speaks of the slander of Oxford to the Queen perpetrated by Howard and Arundel, and shows us that additions were made in the early 1580’s when the Jesuit plot devised by Spain and France to murder Elizabeth and seize the throne for Mary Stuart was revealed to the Queen by Oxford. Until we know the history of the moment which was so important to the author, it is impossible to understand why this speech was ever put in. Oxford was so stung by the whole mess that he simply could not stop himself from dwelling upon it. In his soliloquy, Belarius/Oxford expounds upon his most important theme, that of the rights of the individual which were alluded to earlier. Because we see Belarius again many years later mirrored in the character of Kent in Lear saying much the same thing, we must realize that this continued to be a theme of great importance to Oxford. Hearing Cymbeline refer to him as “a banish’d traitor” (a parallel to Posthumus’ situation at the beginning of the play) Belarius replies, “banish’d man,/I know not how a traitor”. Although he, speaking Oxford’s thoughts, has not been believed and respected by the Crown, he still remains the faithful subject. Belarius has secreted the heirs to the throne in the safety of the wilderness until Cymbeline comes to his senses about the responsibilities of monarchy. Oxford gives Belarius the vision to see that he must preserve the ancient traditions of kingship in the face of a monarch who cannot see clearly and gets too closely involved with dangerous enemies. Even Imogen, symbolizing the Church, cannot distinguish the headless body of Cloten/Satan from that of Posthumus, who is symbolically, Elizabeth’s virtuous, true subject, Oxford. This is a message to Elizabeth that she is not recognizing the danger in her disguised enemies, France and Spain, just as Cymbeline fails to recognize the danger in his queen. Most of all Elizabeth is not recognizing the value of the undying loyalty of her true subject, Oxford. At the end of the play, when the issue comes down to the defense of king and country against the Romans, Belarius and the boys, as well as the returning Posthumus, are shown to be well aware of their duty. Oxford states through Belarius that it is “every subject’s duty to come actively to the support of the monarch especially when that subject has reasons to hold back and thus distance himself from the cause on which the king is seeking unanimity,” # – in Oxford’s time, the Catholic problem. Oxford quickly resolved all of the conflicts in the play with the “pillar and vine” theme representing the ideal State/Church relationship, the pillar of the monarchy supporting and controlling the clinging vine of the Church. The reconciliation of Postumus and Imogen also intertwines these symbols along with the universal theme of forgiveness for the repentance. 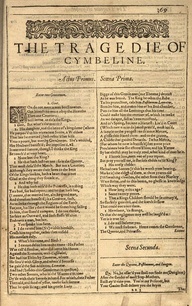 It is curious that Cymbeline was revived and reworked in 1609; many authorities see the hand of Chapman and perhaps others. At this time there was a tremendous paper war being waged regarding the “Oath of Allegiance” controversy. King James had tried to impose this oath upon Catholics to force them to swear allegiance to him, and in so doing renounce the Pope’s authority as Head of the Church with the right to depose a monarch. This was the same controversy revisited from Elizabeth’s reign. 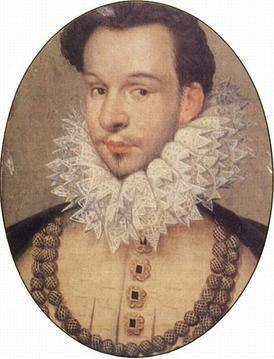 Oxford’s original position, expounded upon by Belarius, was centered upon the rights of the individual to have his own private thoughts and beliefs while remaining unassailably loyal to the monarch. Those opposing James’ actions found a fitting vehicle to resurrect in a similar crisis. Oxford’s message lived on after his death as it does today. Very interesting. It needs thorough reading. Thank you. Pidge has an excellent eye and/or ear for authenticity; I especially (because of what I’m following currently) appreciate paragraph 7, though the entire piece is insightful into a play otherwise somewhat difficult to understand through the Oxfordian lens.